When in doubt, wear a uniform colour. 1. If you want to be photographed, wear neutral colours or uniform ones. Consider yourself a backdrop. 2. Find a friend, fast. Offer to take pictures for someone and they’ll return the favour. 3. Don’t take yourself too seriously and have fun. Almost no one can manifest what they have learned immediately following a demo and even your instructor probably generated less than their best work under scrutiny. 4. Take risks with structure, but not necessarily colour. You’ll never find a more supportive atmosphere for busting out of old molds. The reason I’m cautious on colour: a workshop will have a palette established because it’s easier for beginners to succeed with a curated collection. New blooms + new colour combos + new techniques = too many variables. Make colour the one thing you can count on. Pick a favourite flower (or two) and build out an analogous scheme from there. 5. Finish your bouquet and centrepiece in a timely manner so your work can get in the photographer’s line-up. Trust me, you don’t want to be last—not that the photographer will do any less of a job, but the model may get tired and rightly choose to sit down after her tenth bouquet, but most importantly if you fuss too long you’ll miss the downtime you need to deal with your pictures, post, and prepare for the evening ahead. 6. There will come a point where you hate your work. Walk away from it for a bit. Cruise around and see what others are up to. If you’re really feeling the pressure, step outside or ask for a hug. Try to resist spiralling into private anxiety. Also, take a minute to touch base with yourself: Have you had enough water? Do you need to take your work somewhere quieter? If you move through a list and find you’re still struggling, then let one of the workshop assistants or instructors know. People are there to help you. 7. Try not to drink too much in the evenings. It’s absolutely thrilling to leave your life behind and be surrounded by other flower lovers and gab and gab and gab. But take it from me: Do I wish I’d slept more in the motel near Floret instead of dancing in glee with my earbuds on the first night? Perhaps. 8. Carry a day pack or tote with a pen, notebook, water bottle, a phone charger, personal whatnot, and absolutely everything you might need for ten hours on the semi-glamourous-go. 9. Trust that the universe will deliver the flowers you need. We all know the type that is first to the trough, elbowing in to hoard all the fashionable blooms du jour. Let her/him. They’ll find they don’t need them, or their work will be overblown or well…there’s no other way to say this—it will all work out. One of the key principles of working creatively is constraint. Too many options can stifle creativity. You’ll be faced with a vast buffet, so be grateful for limited options, appreciate what you have to work with, accept it, and begin. What you let go of might come back, but in the meantime you will have created something unique within a narrow range; you'll be on safer footing to innovate. 10. Think through your exit strategy. Do you have everyone’s contact information? Instagram handles for tagging? The name of that ribbon supplier? Do you have a means to get your flowers home? Go into your final day organized so you’re not scrambling or delayed upon your departure. You'll leave feeling calmer, more accomplished and complete. And one extra tip one for the one person who got you there: Thank yourself. No matter what happens, I guarantee everything will change for the better after participating in a floral workshop (as you hoped it would). Abandoned building, pigeon poop, sensational light and materials. The 2.5 acre walled garden planted in a naturalistic style. The walled garden has great drainage (a wee burn runs through the centre) and sandy soil. Although a short walk from the North Sea, Elliot Forsyth, head gardener, uses plants suited to zones 7/8. I was comfortably housed in the clock tower. Suffice to say I was more than alright at Cambo, but not in that moment. From somewhere within me a class-conscious beast reared up and I stuttered, lacking both manners and gumption, not knowing my place. I still don't really: Florist-in-residence, sure, but what is that exactly? Truth is, I pitched them on the idea. I kinda made it up. You see, long have writers and artists been supported by creative residencies to develop new work. Cambo hosts visiting gardeners, so I thought floral design might fit, straddle that space between interiors and exteriors, bridge the domestic to the wild. The new steward Struan and his wife Frances have been creating spaces that do just that (he's a tree surgeon by trade I believe and she trained in tapestry)—building forest dwellings, hosting wedding parties, groovily placing steer skulls about the place—using the wonderful spaces of the estate, indoors and out. This ivory inlaid mantelpiece dates from around 1860 . 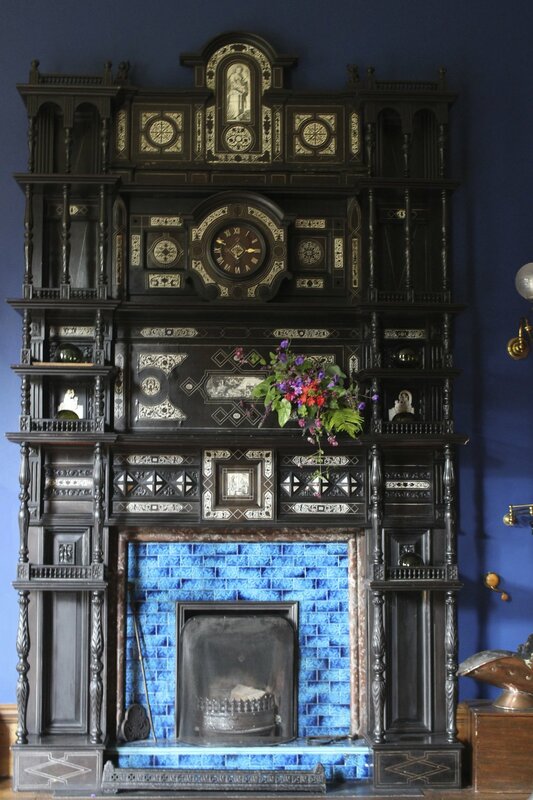 I went into this design with the azure tiles of the billiards room in mind, roaming the borders for purples, deep greens or flowers with punch. We associate the Victorian era with dark tones and heavily draped over-stuffed rooms in part because Queen Victoria was in mourning, but new shocking colours were also in vogue. The elopement of aniline dyes saw magenta, violet and mustard surge into favour. The red/pink Schizostylis stands up to the blue here. I chose Epimedium x versicolor 'Rubrum' for its glossy leaves that mimic the sheen of the tiles, but also because it reminded me of a houseplant, another fashion of the period. The lady fern gives a nod to the Victorian practice of placing ferns in front of the fire grate. Cambo also focuses on environmental education—one of my long-standing interests—so I thought it could be a good fit. I'd visited previously twice (my son attends a university nearby) and been entirely impressed by the gardens, the woodlands, and the estate as a whole. And now looking back at the pictures, having made something new every day, having come to know new plants, stretched myself creatively to design historically, invented not only new designs and scouted locations around the estate daily, I'm pleased with my work. I was tired at the time, very much so. I realize that this work I'm doing requires I be three people in one: a sophisticated gardener, a designer, and a photographer. ( I don't count the writer but I should, I suppose). Having those three or four professions perform at optimum levels for five days straight was harder than I thought. Add travelling to a new place and general waverings between ecstasy and self-doubt…and I wonder now how it all came together as it did. But glory be: it did. The dining room…how could flowers compete? With a chunky purple cabbage, fruit, pumpkins and the grand arc of an artichoke leaf. What does a florist need to know? Botany, plant science, marketing, accounting, design, event planning, wedding etiquette, public relations…I could go on. But one element I hadn’t considered and sorely craved: the history of style. Why this resurgence of moody romanticism? Why the return of the still life? And what precisely does the term ‘history of style’ mean? What, decoratively speaking, is style? And where does one start to learn about style? People have arranged plants for eons, so whose history plays into ‘the’ history of floral design? I took all of these questions to England in November to study at Zita Elze’s Design Academy in London. Elze is known for her couture work—in floral design, but also flower embroidery (picture hand-sewn bridal bodices of flowers, parasols, and Chelsea floral gowns). Her floral shop and school is in Richmond, steps from Kew Gardens where I interned in my twenties. It’s a neighbourhood I know and love, so a trip back didn’t take much coaxing. What did take coaxing was my body—sorely jet lagged, I’d awoken at 1am the day of the class and headed off to Covent Garden Flower Market before dawn (blog post here), tubed back to my cousin’s near Chalk Farm to say farewell, then tubed back to Kew for a 10am start. I was near cross-eyed by the afternoon, pacing to stay awake—not ideal student behaviour, but thankfully the class was tiny: myself and one other American woman joined instructor Lucinda Sanderson, who had come in from France. Floral school this was not. Rather a crash course in the history of interiors. From the Baroque to Art Deco, we moved through kings and queens, dictators and designers, examining fabric, architectural styles and furniture for two days straight. As I write this—and I’ve long put off looking at my notes because they are so detailed—I’m still overwhelmed. What decorative themes separate the Baroque from the Rococo, that movement from heaviness to light? Having the time now to sink into the images, I see a playfulness of form. During the Rococo shells, scrolls and flowers replaced lion’s feet, eagles and trophies. Why? A reaction against formal grandeur, I wrote in my notes. Louis XV loses colonies to England. So why the pastoral romance? The fantastical designs? I don’t entirely know. Looking back, I can see the Revolution rising from the froth of frivolity in France, but turning a page I find not politics, but colour: delicate pastels were favoured in the Rococo over the Baroque’s heavier reds and golds. I want to know more. To place those colours in context, to have them mean something more. Tantalized, I read on. Plants like peonies, carnations and roses were used during the Rococo. I find a list of plants recorded by writers and painters between 1715-1774 including: Lonicera, Jasminus, Ipomoea, Ranunculus, Fritillaria meleagris, Dianthus, Auricula, Gladiolus and Citrus bergamia. That list tells me plant collection continued apace; that list fills me with the excitement of the age. Imagine seeing a morning glory for the first time. Or smelling jasmine. Glasshouses and orangeries were in vogue and the palette of floral designers broadened by the day as new plants came into cultivation. And the vessels used for floral work broadened as well—fine porcelains, epergnes, bulb holders, baskets, and urns. I could go on and on: from the Regency’s fetish for dolphins to Biedermaier’s sleek geometry; from Gothic arches to Sheraton’s neo-classical simplicity. I could study further still, and I might—turn my gaze back in time, try to unfurl the history of my culture one leaf (or motif) at a time. One wonders why a florist might need to know such minutiae. 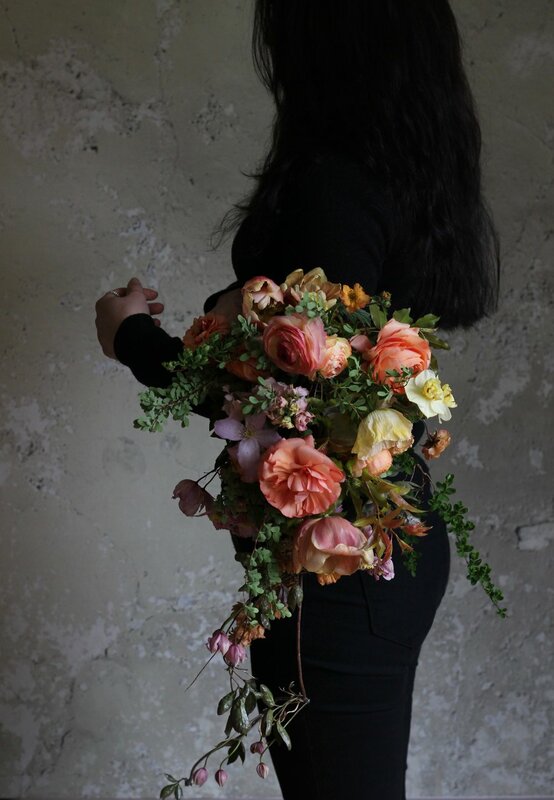 So picture this: you’re a florist in an old city, a city with architecture dating back hundreds of years, and you are calledto do the flowers. What do you use to evoke the period? What plants were in vogue? What style should your work take? Tendrils or not? Symmetry or asymmetry? Scented or unscented? Structured or not? Or perhaps you have a bride who loves Art Deco, maybe wants a grand Gatsby affair; should she carry a tussie mussie or ferns? Or say you’re a curator of a heritage site—a Tudor building or a Federal estate. Or (lucky you) an owner of a Georgian home and want to hit the right botanical notes. There’s no shortage of what one can learn. And I think that’s what I like best about flowers—how beauty becomes botany, and botany ethnobotany, how the history of design guides us to who we were and how our tastes have been formed.